Ram Gopal Varma is back with Part Three of that series, which presented to us the first clear evidence that the great man was slipping, rues Sreehari Nair. To give Ram Gopal Varma credit where it's due, he never had any fondness for compliments. Even in his Rangeela to Company phase, the man always marched to his own drum, licking everybody in the house -- especially those who told him how much they were moved by his last film. The idea was fiercely anti-establishment and Varma set the standards by dethroning all those platitudes commonly doled out in movie magazines and the 'Soul Food' section of leading newspapers. I can't quite explain this, but you had to be a maturing yet indecisive Indian kid in the early 2000s to know exactly how Ram Gopal Varma gave an entire generation a certain artistic poise, an artistic ego. And as we kids took in and built on this artistic ego, Varma shed his own and settled down to perfect the art of endless posturing. Now Ram Gopal Varma is back with Part Three of that series, which presented to us the first clear evidence that the great man was slipping. Sarkar (2005) was the film where Varma's camera stopped documenting and began decorating. 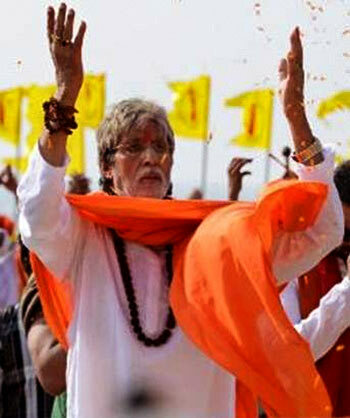 It was the film in which Ram Gopal Varma, in his worship of Amitabh Bachchan, betrayed his own talent. Sarkar 3 is like the cycle of doom, now fully completed. Perhaps Varma could do with a compliment or two, right now. Straight off the bat let us be very clear that the Sarkar series is no tribute to The Godfather, unless you consider Feroz Khan's Dharmatma to be an equal tribute. For The Godfather wasn't a tale of one-man heroism but a story with a tragic core; it was as much about a country, as it was about the Corleone family. What Ram Gopal Varma has been doing in his Sarkar movies is play on loop the basic conceit of The Godfather's Sollozzo segment (Sollozzos come with deals. Sarkar turns them down. Sollozzos swear revenge). It ends with Sarkar triumphing over a dumb-headed Sollozzo. This is not the spirit with which filmmakers thank their inspirations, but one with which video-game companies build 'versions' of their games. And it's a game alright for Varma, who piles on the familiar tropes here: Govinda Govinda-- this time, in Max Q Octophonic Sound; Coup De Grâce delivered between tea sips; deliberations happening over pickle swooping. Varma and his writers introduce Shivaji, who happens to be the child of Vishnu -- Sarkar's slain son from the first film. In keeping with the tradition of this franchise, Vishnu had to die quite simply because Kay Kay Menon's was the only performance (in all the Sarkars put together) that suggested any valid linkage to a Maharashtrian household. Thankfully for Varma, Amit Sadh, who plays Shivaji, possesses none of his father's insistence on achieving any cultural authenticity. Supriya Pathak, as Sarkar's wife, does try to get her Marathi diction right, and pays for it. As for Bachchan, he reads the Lokmat newspaper, and that is as Maharashtrian as he becomes. There are characters both inside and outside Sarkar Bhavan, who hold a finger up, and apprise us about which way the wind is blowing. There's Ronit Roy -- too fine an actor to be caught in this mess -- looking kind of depressed without his bottle, and for whom especially, Varma designs a Jack Daniels-pouring scene. Rohini Hattangadi also gets a peg, and she flashes a sign that says: Beautiful! Yami Gautam looks ravishing, but like everyone else, she stops to rub her fingers and twist her ankles -- since Varma 2.0 won't let the slightest hint of villainy slip away. There's Manoj Bajpayee as Deshpande, whose acts of heroism include turning down a mike, and searching for the right phrase in the middle of a speech, and who gorgeously hams it up -- like intelligent actors do when playing roles of no significant intelligence. Finally, there's Jackie Shroff as Michael Vallya, playing the single-most embarrassing character of his life, who cuts phone calls to tell his girlfriend about the wives he has bumped off, as the girlfriend feeds dolphins, talks to the sharks, and walks her dog. Maybe there was a subtext in the Vallya segment, only I am not quite sure what it was. All the characters have complaints reserved for poor Sarkar, who listens to them patiently and finally delivers the franchise's tagline: I only do what I think is right. It's the kind of 'hollow-punk thing' you can get away with saying, in high school. In his Sarkar movies, the 12-year-old Ram Gopal Varma seems to be suggesting that an all-caring, good-hearted fascism is at any rate better than a confused democracy where everyone has a voice. Often, in such reductive movies, it's the staging of scenes that gives away the picture's lack of imagination. There's a profusion of such techniques in Sarkar 3. Every line uttered 'cuts' to the next line. Every effect is made explicit and flagged for you. Varma's idea of irony, for example, is to make evil characters stride in with the image of a Ganesha idol in the background, and to set a debate about 'Ethics in Politics' against a statue of Mahatma Gandhi. Varma's camera seems to have been zooming in so relentlessly that it now looks over characters' shoulders, into some absolute oblivion. Everyone's either super confident or damn nervous or very angry or uncontrollably raunchy or all of the above, irrespective of whether they are discussing politics, talking on stage, or simply dipping a Marie biscuit into a cup of tea. Also, it's now clear that Varma's idea of 'composing a scene' is inserting artifacts between two conversing characters. There's a pug figurine in the foreground that blurs out as Sarkar talks. A Laughing Buddha stands as a stooge in scenes where evil plans are hatched. The key aspect to note here is that nothing, not even a single frame, seems borrowed from life; they are all Executive Decisions, and half-assed ones at that. There's a Ganpati visarjan sequence here, which, if you are a Satya fan like me, will make you cry. Directors do croak, but to go from that scene where Govind Namdev's body is tossed over by a wave TO a scene where a close-up of Amitabh Bachchan's teeth details every letter of his chant, is to offer the most unflattering summation of which way your filmography is headed. For me, a director's cinematic approach often says a lot about his larger philosophy, and Ram Gopal Varma's present approach suggests an extreme literalisation of the punkish values he once advocated through his interviews. This makes me wonder if Varma's ability for self-destruction was always built into his greatness. Here's what is paradoxical: For sheer power, no imagery he has thought up since beats that white text on black screen. In his interviews, you felt that there burned in Ram Gopal Varma a constant yearning to be viewed as an enigma. If it helps, he has now truly become one.